The Chachapoya culture was an Andean culture located in the cloud forests of northern Peru. It’s not clear when the culture originated, but it was conquered by the Incas around 1475 AD. When Francisco Pizarro arrived in Peru in 1532, the hostility of the Chachapoyas toward the Incas led many of them to side with the Spanish. 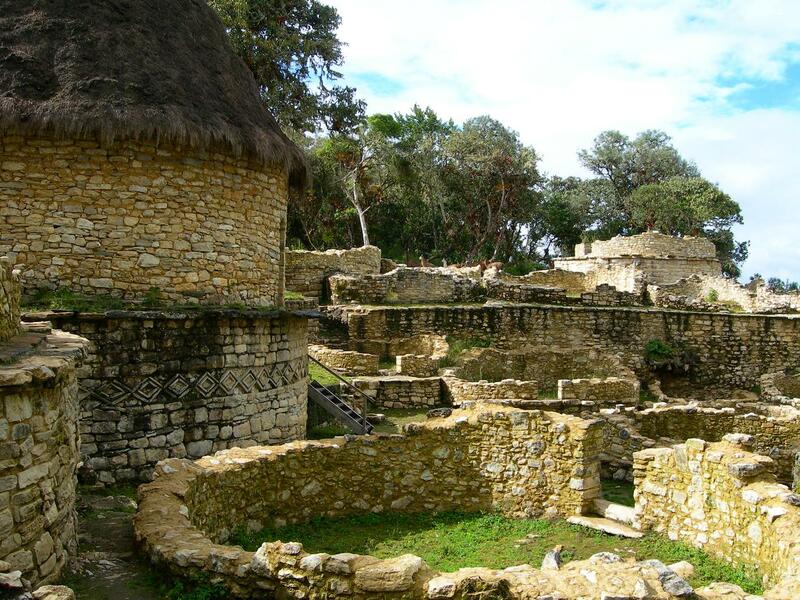 The most spectacular remnant of the Chachapoya civilization is Kuelap, a mountain fortress built at an altitude of 10,000 feet. In terms of the mass of stone used, Kuelap is even bigger than the Great Pyramid of Giza. Much of Kuelap is dated to around 800 AD, but parts of it have been dated to around 500 AD, and it is thought that construction began around 400 AD. Part of Kuelap is shown in the photograph below. These Indians of Chachapoyas are the whitest and most attractive of any that I have seen in the Indies, and their women are so beautiful that many of them were worthy to be wives of the Incas, and to be taken to the temples of the sun. To this day the Indian women of this race are exceedingly beautiful, for they are white and well formed. They go dressed in woolen clothes, like their husbands, and on their heads they wear their llautos, the sign by which they may be known in all parts. 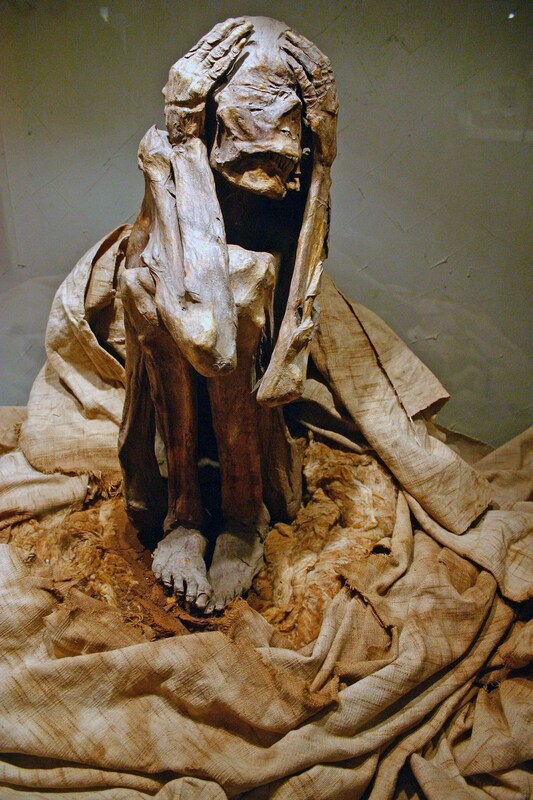 As in many of the other ancient Andean cultures, the Chachapoyas mummified their dead. In all of the photographs of Chachapoya mummies that I have seen, they appear to have Caucasoid rather than Mongoloid cranial morphology. In most of the photographs the hair is missing, but I have been able to find a few where the hair is intact. One such photograph is here. Three more are here, here, and here. These photographs clearly show that Chachapoyas had curly brown or red Caucasoid hair, and not stiff black Mongoloid Amerindian hair. 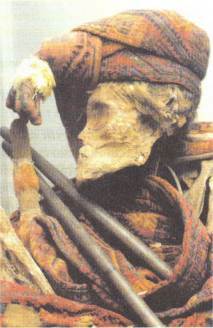 Many of the Chachapoya mummies are from the Laguna de los Cóndores site. The photograph of human remains from this site here (full size here) clearly shows that the individual had red or reddish-brown Caucasoid hair. Along the southern coast of Peru the Nazca culture flourished from 100 BC to 800 AD. A major burial place for this culture was the Chauchilla Cemetery, which was established around 200 AD and was used for 600 to 700 years. Doing a Flickr search for “chauchilla” produces a large number of very high-resolution, very close-up photographs of the human remains at the cemetery, the vast majority of which have their hair intact. A good example is here (full size here). When you view these photographs, make sure you find the page with all of the sizes of the photograph when it’s available. These photographs make it 100% clear that the Nazca people had red and brown Caucasoid hair. There is a photograph here of a 3,410-year-old mummy from northern Chile. In the caption for this photograph, the liars at New Scientist magazine tell their readers that she has “long black hair”. In my White Gods post I said that she had brown hair, but I have since found another photograph of the same mummy in this article that makes it clear that she actually had red hair. A commenter on this article asks “The 13th Century Peruvian woman had red hair, but this was the pre-Columbus period. Can anyone explain please?”. I can. White people were in Peru before Columbus. Many of the Chachapoya mummies were positioned with their hands over their faces. The first of the four photographs I linked to above gives an example, and more examples can be seen here. This same practice can be seen in the photograph of a Paracas mummy here. The Paracas culture existed along the southern coast of Peru between 1200 BC and 100 BC. Some of the Paracas mummies had blond hair. Thor Heyerdahl included a photograph of the head of a blond Paracas mummy in his 1952 work American Indians in the Pacific (number 3 on the color plate here). Another photograph of a blond Paracas mummy, with white skin, can be seen here. This documentary on the Chachapoyas aired a couple of months ago. At 45:55 a painting from the Inca period is shown that depicts captured Chachapoya women. The women have Caucasoid facial features, light skin, and reddish blond hair. The documentary then shows some of the modern-day descendants of the Chachapoyas, who are called “Gringuitos”, or “little Gringos”, by the other Peruvians. These people have light skin, blond or red hair, and sometimes freckles, and yet they have no recent European ancestry. The documentary then talks about genetic testing done on the “Gringuitos”, which showed that they have between 10% and 50% European admixture, and that their red hair is of European origin. The testing further showed that their European admixture is specifically from Western Europe, and that R1b is found in the “Gringuitos”. The YFull spreadsheet shows that 9 out of the 41 1000 Genomes Peruvian samples (22%) are R1b. Note that my K = 26 admixture analysis of Amerindians and Mestizos showed that the 1000 Genomes Peruvian samples have Caucasoid admixture beyond what is found in all Amerindians, but that this admixture is distinct from the kind of additional Caucasoid admixture that is found in Mestizos, and that it therefore cannot possibly be from the post-Columbian Spanish. In my post on the White Gods I said that I thought they came to the Americas from Northwest Africa and the Canary Islands. My analyses of Chachapoya genomes showed that the largest K12b component for the sample NA47 was the Northwest African component. Some of the original inhabitants of the Canary Islands, the Guanches, had a Nordic phenotype, with blue eyes and red or blond hair, while others had a Mediterranean phenotype. In this ancient DNA study, 10% of samples from Guanche remains were found to be R1b, while 27% were found to be E1b1b1b-M81. R1b is associated with the centum Indo-European languages, and E1b1b1b-M81 is associated with Berber languages. In his book The White Indians of Nivaria, Gordon Kennedy notes that the language of the Guanches contained both proto-Indo-European and Berber elements. The language of the Guanches of Tenerife had a particularly strong affinity to proto-Indo-European, and George Glas noted in 1764 that he thought the Tenerife language had some resemblance to the language of ancient Peru. 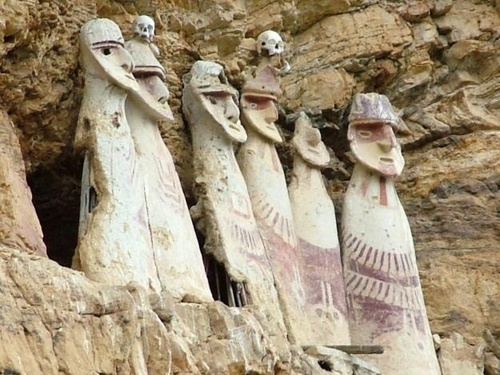 Some Chachapoya mummies were placed in the sarcophagi shown in the photograph below. Note that the faces of these sarcophagi have Caucasoid features, including a strong brow ridge, a high nasal bridge, and what is either a strong chin or a beard. Also note how similar these sarcophagi are to the Moai of Easter Island shown in the next photograph. Heyerdahl believed that Polynesia had first been populated by the White Gods of Peru around 500 AD. The balsa raft that he sailed from Peru to Polynesia in 1947 in order to prove that his theory was possible was named after Kon-Tiki Viracocha, the White creator god of ancient Peru. The bearded face of Kon-Tiki was painted on the raft’s sail. I recommend reading Heyerdahl’s 1971 article “The Bearded Gods Speak“, which contains a great deal of scholarship on the White Gods. 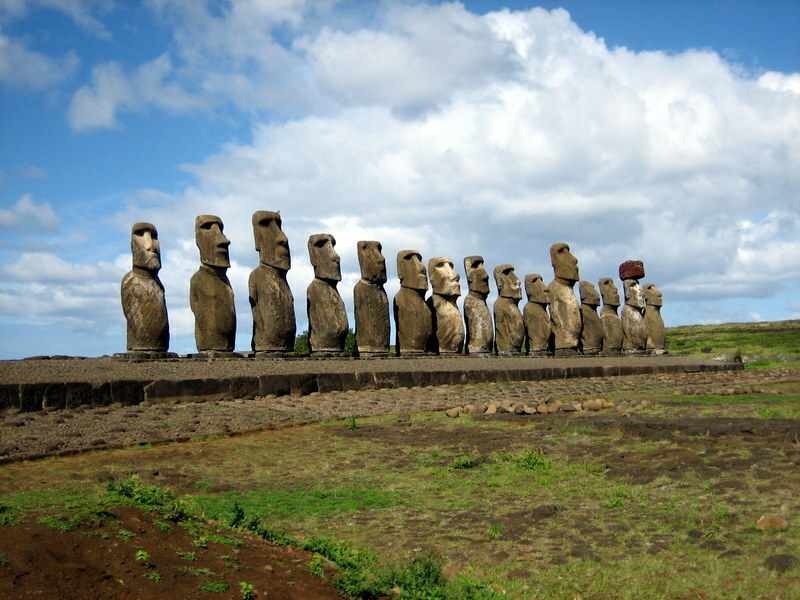 The oral history of the Easter Islanders tells of two distinct races of people on the island, the Hanau epe, or “long-ears”, and the Hanau momoko, or “short-ears”. The Hanau epe were the first inhabitants of the island, and they were the people who created the Moai. They were said to have had red hair, fair skin, and thin noses, while the Hanau momoko had black hair, dark skin, and flat noses. The reason the Hanau epe had long ears is that they wore large ear ornaments that elongated their earlobes. Note that my White Gods post includes a photograph of ceramic vessels from the pre-Inca Moche culture that are in the form of Caucasoid men, and that these men are wearing large ear ornaments. All of the Moai also have long ears. The Hanau momoko came to Easter Island later, possibly around 1100 AD, and they ultimately rose up against the Hanau epe and killed all but one of them. This one survivor must have gone on to have children, because even in recent decades there were red-haired natives on Easter Island who claimed descent from the original Hanau epe. This study analyzed DNA samples taken in 1971 from 48 nonadmixed Easter Island natives, and it found that 5 of them (10%) were R1b. It also found that several of the natives had a European HLA haplotype whose frequency peaks in Basques. (Note that my K = 26 admixture analysis of Amerindians and Mestizos showed that a primary component in the additional Caucasoid admixture found in Peruvians is a Basque component.) The study notes that the genealogy of the natives sampled implies that the R1b and the HLA haplotype must have been introduced to the island before about 1816. The authors of the study of course suggest that this introduction occurred sometime between the modern European discovery of the island by the Dutch explorer Jacob Roggeveen in 1722, and 1816. But the fact is that Roggeveen noticed to his surprise that there were already what he termed “white men” among the islanders when he got there. The authors also toss out another politically-correct explanation that suggests that the R1b and the HLA haplotype is from the crew of a Spanish caravel that vanished in Polynesia in 1526. Not only is there not a shred of evidence to support this explanation, it is also contradicted by the facts. The Easter Island natives had committed to memory detailed genealogies of their white-skinned ancestors, and by taking an average Polynesian generation to represent 25 years, it was found that these genealogies start around 500 AD. The highest civilisation and culture, apart from the ancient Hindus and Egyptians, are found exclusively among the white races; and even with many dark peoples, the ruling caste or race is fairer in colour than the rest and has, therefore, evidently immigrated, for example, the Brahmans, the Incas, and the rulers of the South Sea Islands. Some of the Paracas mummies had stiff black Mongoloid Amerindian hair. The results of my analyses of Chachapoya genomes imply that at least some of the Chachapoya mummies must have also had such hair. I suspect that Carlos Bustamante and Eske Willerslev know very well that most of the Chachapoya mummies are Caucasoid, but that they deliberately selected the few mummies with Mongoloid hair for their paper, in an attempt to conceal the truth. They slipped up, however, by allowing at least one mummy with some additional Caucasoid admixture, NA47, into their cherry-picked sample. Along with the “scientific community”, the “HBD community” has also sought to deny or suppress the truth about White people in the Americas before the Vikings. In this post Dienekes declared that the White Gods are “in the realm of alernative [sic] history”. And in my 2013 in review post you can read about how Greg Cochran repeatedly deleted my comments containing facts about Caucasoids in ancient Peru.